Sr. Flathead Champs going for $150 Payday on Friday, October 19, plus a Complete Regular Show of All Classes set for the evening. The Final 2 Races are upon the raceway as this Friday Night, the engines will be roaring in the Pocono’s as the racers of Snydersville duke it out for the coveted Championships! 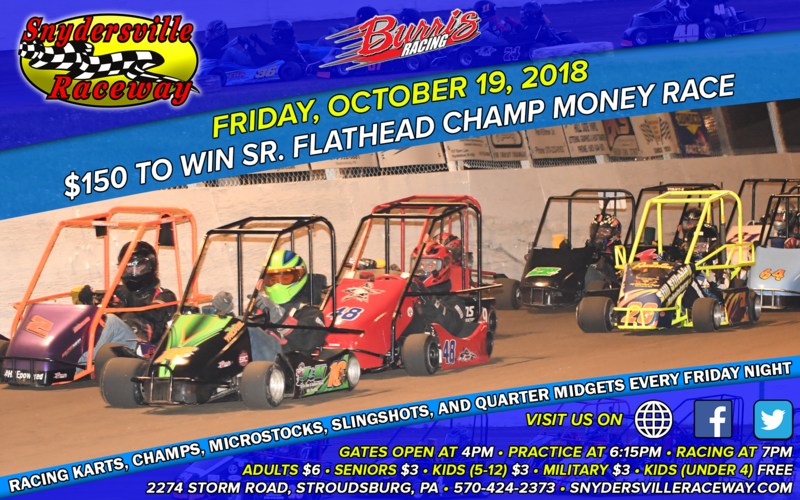 This week All Classes of Karts, Champs, Microstocks, Slingshots, and Quarter Midgets will be on the card, Plus we have a $150 to win Sr. Flathead Champ Money Race. Load those karts up and come join us at The Bullring of the Pocono’s “Where It’s Dirt Racing at Its Best!”. Gates open at 4pm, Practice at 6:15pm, and Racing at 7pm.